Karl Bellve is a cross-discipline scientist covering the fields of Biology, Computer Science, and Electrical Engineering. He obtained his Ph.D. in Molecular and Cellular Biology (1996, U.MD) and joined the Biomedical Imaging Group in 1997. More information about the Biomedical Imaging Group can be found from http://big.umassmed.edu. His focus is on the design and implementation of computer systems and software to control various electronics, including high-speed CCD cameras, and coordinate the high-speed electro-optical/mechanical systems, and to develop the software for specific imaging protocols necessary to gather imaging data, as well as necessary image computation and display tasks required on the control computer, and the User Interface Software that makes the system accessible. He is extremely well qualified for this role, as he designed, built and programmed the entire computer and control system for the fast TIRF/GFPM microscope system. His work has resulted in the creation of a novel high-speed fluorescence microscope system that can rapidly produce high-resolution, 3-dimensional images of fluorescence inside single cells, as well as corresponding images of near plasma membrane events at speeds of 90 images per second, using a specialized technique called Total Internal Reflection Fluorescence (TIRF) imaging, developed and implemented in collaboration with the Optical Physicists of the Biomedical Imaging Group. Additionally he has created the ability to rapidly produce 3-dimensional reconstructions of cells from 3-D images (using a process known as "deconvolution microscopy") by having developed and programmed a high-speed cluster of inexpensive computers (sometimes known as a Beowulf cluster) for this purpose. He was the first on campus to take advantage of using GPUs to exponentially speed up processing-intensive applications like 3D Deconvolution. A key feature of his efforts has been to contribute his software back to the scientific community. As an example, he is a significant contributor to uManager, an open source microscope acquisition package. He has contributed multiple device adapters, java classes, and bean shell scripts to the uManager code base, as well as solved difficult programming problems for the uManager community. "Open source hardware is hardware whose design is made publicly available so that anyone can study, modify, distribute, make, and sell the design or hardware based on that design." With that in mind, he recently developed an Open Hardware Focus Stabilization project called pgFocus. pg is short for "pretty good", and is meant to poke fun at other names like Perfect Focus, Definite Focus, and Ultimate Focus. pgFocus monitors focal changes through the positional changes of a reflected laser beam. A significant feature of pgFocus is it acts as a "man-in-the-middle." It is designed to pass through faster high fidelity signals meant for a piezo Z controller while adding a slower focus control signal. This happens in the analog realm, which avoids sampling artifacts introduced by digitizing the original signal. 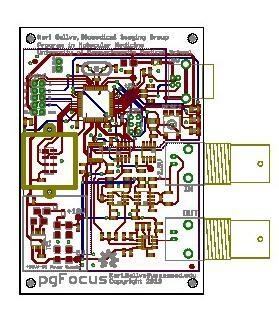 This design also reduces the cost of pgFocus. Zheng K, Lu P, Delpapa E, Bellve K, Deng R, Condon JC, Fogarty K, Lifshitz LM, Simas TAM, Shi F, ZhuGe R. Bitter taste receptors as targets for tocolytics in preterm labor therapy. FASEB J. 2017 May 30. PMID: 28559440. Zhang L, Bellve K, Fogarty K, Kobertz WR. Fluorescent Visualization of Cellular Proton Fluxes. Cell Chem Biol. 2016 Dec 22; 23(12):1449-1457. PMID: 27916567. Ly S, Navaroli DM, Didiot MC, Cardia J, Pandarinathan L, Alterman JF, Fogarty K, Standley C, Lifshitz LM, Bellve KD, Prot M, Echeverria D, Corvera S, Khvorova A. Visualization of self-delivering hydrophobically modified siRNA cellular internalization. Nucleic Acids Res. 2017 Jan 09; 45(1):15-25. PMID: 27899655. Kubo T, Brown JM, Bellve K, Craige B, Craft JM, Fogarty K, Lechtreck KF, Witman GB. Together, the IFT81 and IFT74 N-termini form the main module for intraflagellar transport of tubulin. J Cell Sci. 2016 May 15; 129(10):2106-19. PMID: 27068536. Wu S, Bellve KD, Fogarty KE, Melikian HE. Ack1 is a dopamine transporter endocytic brake that rescues a trafficking-dysregulated ADHD coding variant. Proc Natl Acad Sci U S A. 2015 Dec 15; 112(50):15480-5. PMID: 26621748. Rojas-Rodriguez R, Lifshitz LM, Bellve KD, Min SY, Pires J, Leung K, Boeras C, Sert A, Draper JT, Corvera S, Moore Simas TA. Human adipose tissue expansion in pregnancy is impaired in gestational diabetes mellitus. Diabetologia. 2015 Sep; 58(9):2106-14. PMID: 26067361. Lefkowitz JJ, DeCrescenzo V, Duan K, Bellve KD, Fogarty KE, Walsh JV, ZhuGe R. Catecholamine exocytosis during low frequency stimulation in mouse adrenal chromaffin cells is primarily asynchronous and controlled by the novel mechanism of Ca2+ syntilla suppression. J Physiol. 2014 Nov 1; 592(21):4639-55. PMID: 25128575. Rojas-Rodriguez R, Gealekman O, Kruse ME, Rosenthal B, Rao K, Min S, Bellve KD, Lifshitz LM, Corvera S. Adipose tissue angiogenesis assay. Methods Enzymol. 2014; 537:75-91. PMID: 24480342. Guo D, Standley C, Bellve K, Fogarty K, Bao ZZ. Protein kinase Ca and integrin-linked kinase mediate the negative axon guidance effects of Sonic hedgehog. Mol Cell Neurosci. 2012 May; 50(1):82-92. PMID: 22521536. De Crescenzo V, Fogarty KE, Lefkowitz JJ, Bellve KD, Zvaritch E, MacLennan DH, Walsh JV. Type 1 ryanodine receptor knock-in mutation causing central core disease of skeletal muscle also displays a neuronal phenotype. Proc Natl Acad Sci U S A. 2012 Jan 10; 109(2):610-5. PMID: 22203976. Lefkowitz JJ, Fogarty KE, Lifshitz LM, Bellve KD, Tuft RA, ZhuGe R, Walsh JV, De Crescenzo V. Suppression of Ca2+ syntillas increases spontaneous exocytosis in mouse adrenal chromaffin cells. J Gen Physiol. 2009 Oct; 134(4):267-80. PMID: 19786582. Li X, Standley C, Sapp E, Valencia A, Qin ZH, Kegel KB, Yoder J, Comer-Tierney LA, Esteves M, Chase K, Alexander J, Masso N, Sobin L, Bellve K, Tuft R, Lifshitz L, Fogarty K, Aronin N, DiFiglia M. Mutant huntingtin impairs vesicle formation from recycling endosomes by interfering with Rab11 activity. Mol Cell Biol. 2009 Nov; 29(22):6106-16. PMID: 19752198. Kolpak AL, Jiang J, Guo D, Standley C, Bellve K, Fogarty K, Bao ZZ. Negative guidance factor-induced macropinocytosis in the growth cone plays a critical role in repulsive axon turning. J Neurosci. 2009 Aug 26; 29(34):10488-98. PMID: 19710302. Huang S, Lifshitz LM, Jones C, Bellve KD, Standley C, Fonseca S, Corvera S, Fogarty KE, Czech MP. Insulin stimulates membrane fusion and GLUT4 accumulation in clathrin coats on adipocyte plasma membranes. Mol Cell Biol. 2007 May; 27(9):3456-69. PMID: 17339344. Bellve KD, Leonard D, Standley C, Lifshitz LM, Tuft RA, Hayakawa A, Corvera S, Fogarty KE. Plasma membrane domains specialized for clathrin-mediated endocytosis in primary cells. J Biol Chem. 2006 Jun 9; 281(23):16139-46. PMID: 16537543. Scriven DR, Klimek A, Asghari P, Bellve K, Moore ED. Caveolin-3 is adjacent to a group of extradyadic ryanodine receptors. Biophys J. 2005 Sep; 89(3):1893-901. PMID: 15980179.